Please join us on Thursday February 7th, 2019 at 15.00pm GMT / 16.00pm CET/ 10.00am EST / 07.00am PT for a presentation and discussion with Paul Reynolds, Partner and Chief Research Office at ISG. ISG is the leader in market research for the 45B Outsourcing Industry. Join this IIAR Event to better understand ISG’s position in the research market, and how you can work better with their advisors. Paul Reynolds from ISG will be our host. Paul leads Momentum, a division of ISG that provides research services to help service providers better target, win and retain business. 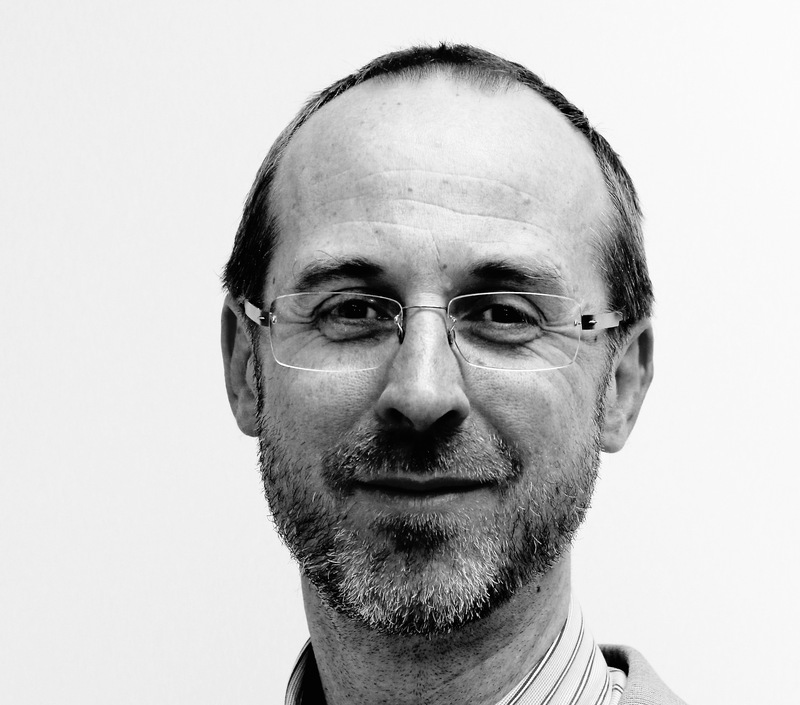 Paul has 25 years of market research experience with specific expertise in methodology development, data analytics and research process design. 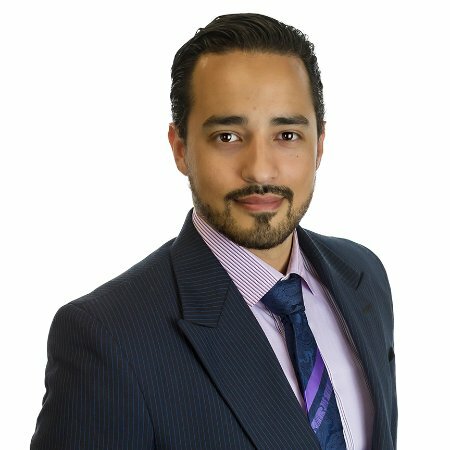 Having found many service providers’ Advisor Relations functions to lack appropriate analytics, Paul is working to develop innovative new approaches that allow for data-driven programs based on the unique needs of each client. His approach benefits Advisor Relations, go-to-market functions, sales, strategy, marketing, and market/competitive intelligence teams. Join the IIAR for a one-hour Discussion Group. The discussion will be co-hosted by Paul Reynolds (@PaulLReynolds LinkedIn) of ISG and Beth Torrie (@bethtorrie, LinkedIn) IIAR USA Board. This spring, Crisp Research announced the appointment of well-known industry analyst Stefan Ried to head up a new practice area focused on the Internet of Things. For @Crisp_Research, his arrival was a big step – signaling aspirations beyond its core DACH market (Germany, Austria and Switzerland) to grow and cover all of Europe. And for @StefanRied, it was a return to the analyst industry after spending the last two years with a vendor. 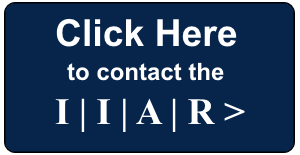 IIAR Forum and Webinar – How well do you know 451 Research? 451 Research has been growing rapidly over the past few years, with an analyst team of 120+ and a diversified set of data-driven research services. 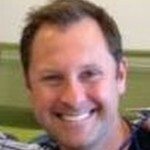 James Stanton, (@stantonibus, LinkedIn), SVP Marketing will provide an overview of the company. He will be accompanied by William Fellows, VP and Founder of 451, (@wif, LinkedIn) and Penny Jones, (@PennyJones451, LinkedIn), a Senior Analyst focused on European Services who will provide an overview of her coverage area and help answer questions on how best to engage the 451 Analyst team. A growing issue for AR pros and their companies is defining what ‘digital’ means. Or, more importantly, understanding how the different industry analyst firms define digital and “digital transformation”. 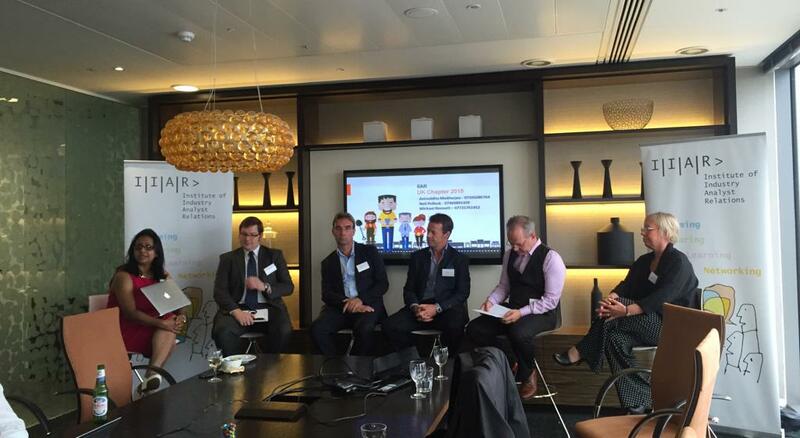 It is certain that digital will “disrupt”, and that more existing businesses will get ‘Uber-ed”, as one of our panellists put it. However what is less clear is just how and where digital transformation will impact existing business models over the next few years, as well as what the opportunities and threats will emerge from digital. How might the AR pro navigate the new digital landscape when briefing and engaging with industry analysts firms? 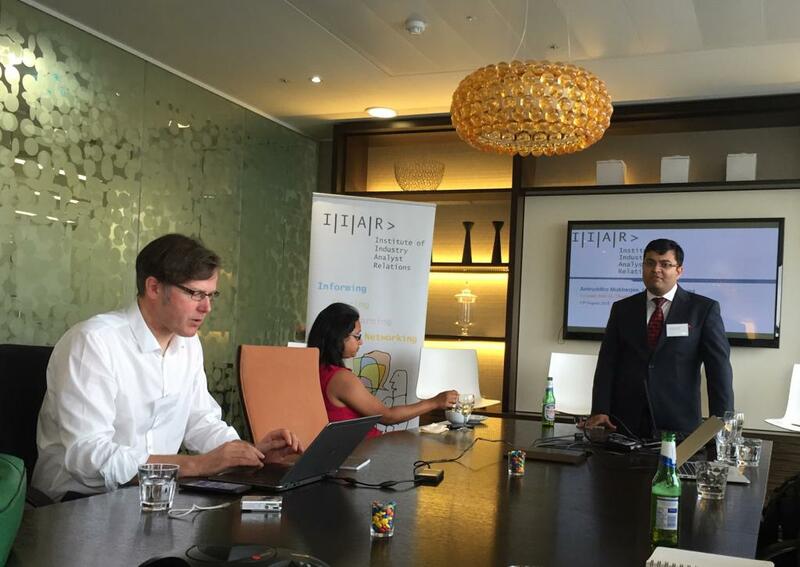 These were just some of the questions posed to a distinguished panel of leading industry analysts at the latest IIAR event hosted at the glamourous Heron Tower on August 13th 2015. 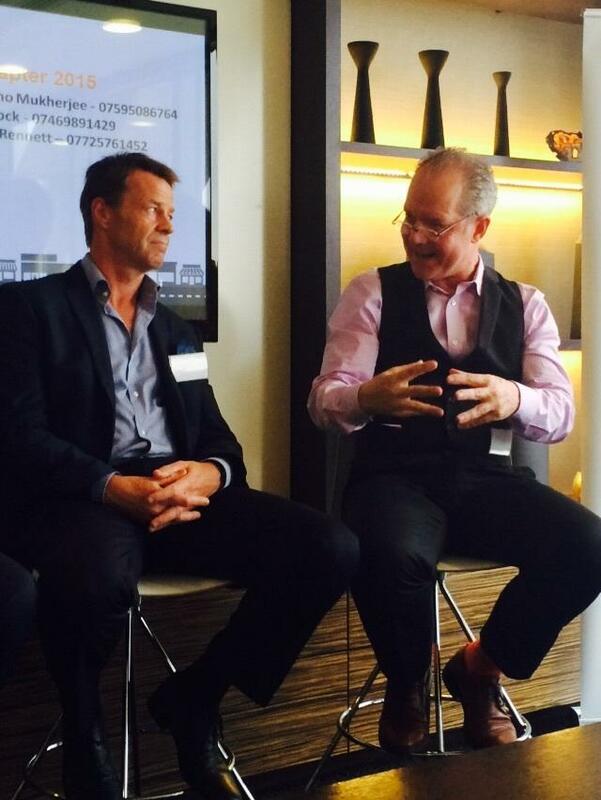 Is 2015 a tipping point in terms of digital transformation? The convenor, Debleena Paul, got the ball rolling by asking the panellists whether 2015 is a tipping point in terms of digital transformation. Are digital technologies beginning to bring the kind of disruption that has been promised for some time? Marianne Kolding (Vice President and Executive Sponsor, European Digital Transformation Practice at IDC) responded that it was coming but that it was not there yet. A lot of firms have it on their agenda and are “dabbling”, but change wasn’t happening everywhere. 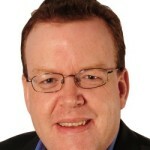 Tim Walters (Co-founder and Principal Analyst at Digital Clarity Group), saw that ‘phase 1’ of the change had occurred, where companies beginning to educate the public about how digital was something that they would need, but that ‘phase 2’, where companies were beginning to think about what they were going to do about it, was only just beginning. Very quickly the panellists got to the issue plaguing discussions of digital transformation thus far: What exactly is it? Tom Reuner (Managing Director for IT Outsourcing Research at HfS), thought that digital transformation meant different things to different people. The term was being used by everyone simply as a place holder. Debleena quizzed the panellists on what their definition was – noting how each industry analyst firm seemed to have a different conception of digital transformation. Marianne Kolding told the audience that IDC saw digital transformation as where the business model for the company was fundamentally changed. This was both in the way it served its customers but also how its employees operated. For IDC, digital transformation was not just about reconfiguring the front-end but also transforming back office processes. Firms had to build a new way of looking at technology. Digital transformation cannot simply be another project, she argued, it has to be a process. Dominic Trott, (Senior Analyst Digital Business at PAC), told the audience that PAC has two definitions for digital transformation. The first is tackling the front end where the company attempts to build tighter customer interactions but the second is a broader change in culture and mindset in terms of reorganising the business around the needs of the customer. Tim Walters reminded the audience that the kinds and amount of change that companies were undergoing today was not unprecedented. Companies had been subject to similar waves of change through earlier technologies. And like these waves before companies needed to understand and react to the specific energy in the wave. What is different this time, argued Tim, was that whereas in past waves it was the company that led the change, this time around it is the consumer that is empowered; it is the customer that is driving the change. AR Pro Tip 101 on how to improve a presentation: Ask the analyst what they would find valuable! The conversation turned to how AR pros might improve the way they present their companies digital transformation strategy to industry analysts. Here, rather than dissensus, there was much agreement. Tom Reuner strongly pushed for companies not to present technologies but “narratives”. Companies needed to come up with narratives which were true for their organisation as they were for the problems experienced by their customers. 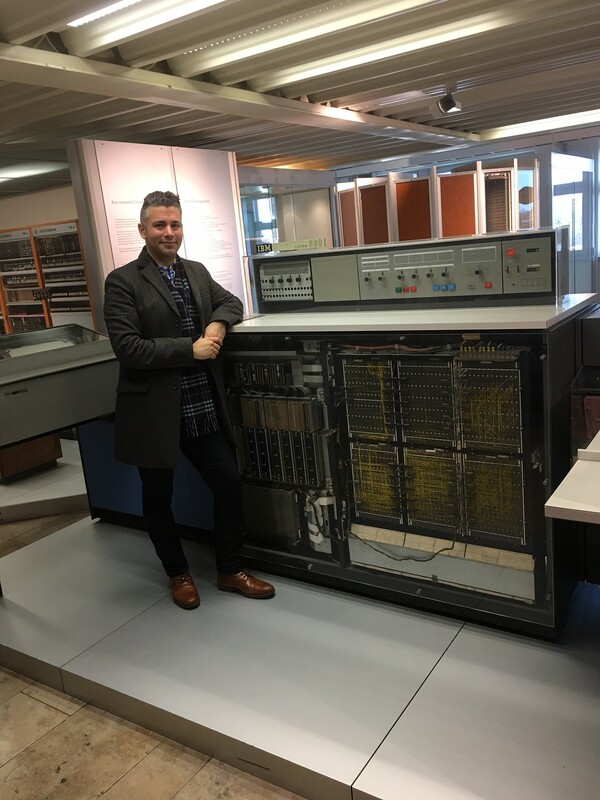 Rather than standard ‘corporate decks’, Gerry Brown, (Senior Analyst, Customer Engagement in Digital Technology at Ovum), wanted to hear ‘war stories’. This includes what has worked and what hasn’t; the upsides and downsides of the digital transformation strategy. Tim Walters was similarly interested in hearing the ‘process’ by which the company understands their customers’ problems. He was much less interested in companies telling him what they can do, but rather how they were now doing things they couldn’t do before, because a client has a new problem and has asked for it. You’re read what we think. We’d love to hear your point of view on what digital transformation might mean for companies and how AR pros could do a better job of communicating their transformation strategies to industry analysts and others. We’re working on a longer version of this blog post, and would like to incorporate your feedback into a white paper that would be circulated with IIAR members. Let us know your experiences. Add your comments to the blog or email us. It wasn’t all digital transformation, however. 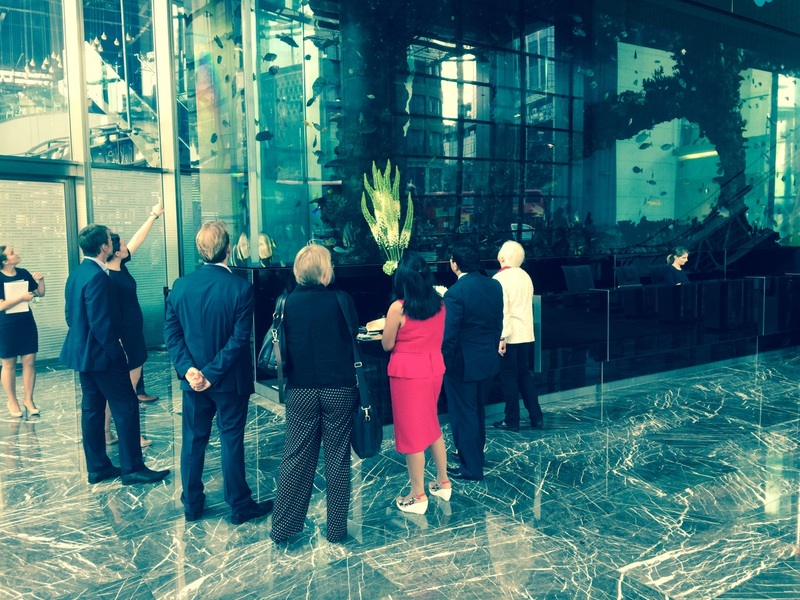 There was also time for some of the event attendees to enjoy an expert talk on the famous Heron building fish tank! We learnt it was the largest privately owned fish tank in Europe, and the names of quite a few fish too! 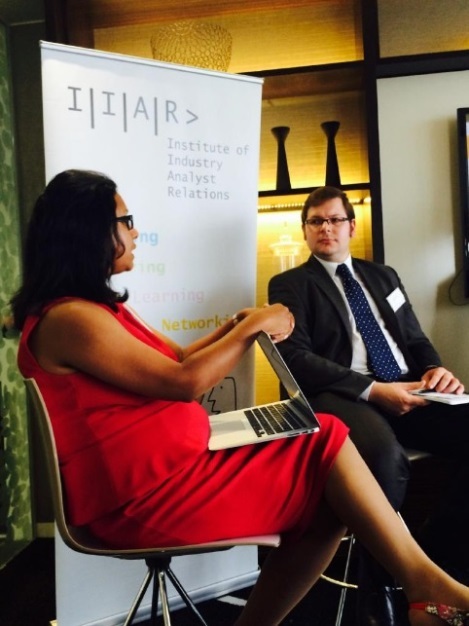 #IIARReception2015 – Summer Party Pictures at Flickr! 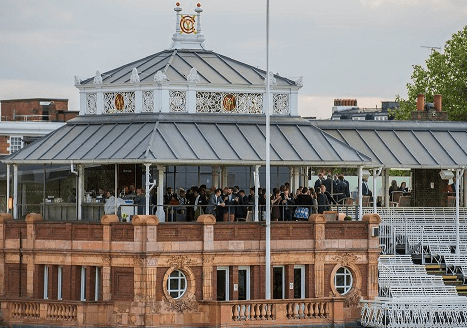 The prestigious Lord’s Pavilion Roof Terrace set the scene for the biggest IIAR Summer Networking Party – a very special evening of drinks, jazz and networking with a crowd of more than 120 guests from 50+ firms and no powerpoint in sight! Companies in the IT Research space have always carried a big reputation – often appearing to be bigger than they are and drawing interest from many corners. Outsell, Inc. has been an industry watcher of the research and business information space for many years and conducts an annual market size and share effort for the IT Research space as well as related information markets. Kable recently underwent a rapid transformation, after its ownership was transferred for £2.3m from the Guardian Group to Progressive Digital Media Group, the company presided over by Mike Danson -the fhe founder of Datamonitor which he later sold to Informa for £502m. Constellation Research Inc, a next generation research analyst and advisory firm helping clients navigate emerging and disruptive technologies, announced today that Adrian Bowles has joined as a Vice-President & Principal Analyst. Bowles will focus on technologies and practices that support sustainable business growth. The IIAR London Forum is scheduled for Thursday, January 20th in Central London from 3:45 – 6:30 pm. The guest analyst session will feature a discussion with Ovum analysts. Brett Azuma, Senior Vice President at Ovum will be joined by Tim Jennings and Carter Lusher. We still have a few places left, and non-members are invited to attend one London Forum. Please RSVP to Jane Courtenay, jcourtenay(at)analystrelations(dot)org. The IIAR London Forum is scheduled for Thursday, January 20th in Central London from 3:45 – 6:30 pm. The guest analyst session will feature Brett Azuma, Senior Vice President at Ovum. Members should RSVP to Jane Courtenay, jcourtenay(at)analystrelations(dot)org. Pierre Audoin Consultants, the software and IT services analyst firm, is delighted to announce that software industry expert Philip Carnelley has joined its UK team. 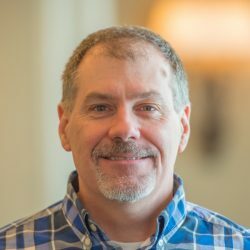 Philip has taken on the position of Research Director, with a focus on leading the companyʼs research and consulting services in the dynamic software and application services markets as well as becoming a key contributor to PAC Cloud research team.